Council still has the power to derail LRT even with $70 million already spent on the project. But voting to kill the 100-per-cent provincially funded, $1-billion project would be procedurally difficult and fraught with legal risk, councillors were told during a 12-hour marathon meeting Tuesday. The prospect of a potential vote for or against LRT by a divided council attracted 150-plus residents to watch as well as two dozen who spoke publicly for and against the project. Enthusiasm for such a vote any time soon fizzled after lawyer George Rust-D’Eye suggested a move to delay or stop LRT would require two-thirds council support because of prior votes to move the project forward. 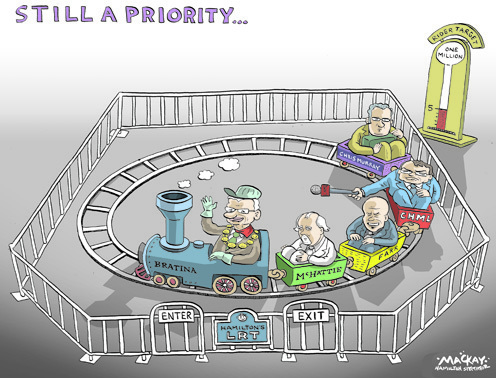 Two councillors — LRT supporter Sam Merulla and vocal critic Terry Whitehead — did put forward a motion late in the meeting suggesting Metrolinx look at improving A-line transit up the Mountain alongside the funded LRT project. Metrolinx project head Andrew Hope said it was too early to say if the agency would look at such a request. “We would need to have further discussions with the city to understand what the actual intent is here,” he said. Other councillors like Judi Partridge and Brenda Johnson, however, asked if council had any LRT “off-ramps” remaining, including major route changes or even a rethink to pursue bus rapid transit. City manager Chris Murray said council still has an opportunity to vote on “major milestones” including the environmental assessment submission next spring, an operating and maintenance agreement and a “master agreement” with Metrolinx. He emphasized council has already committed “in good faith” to moving LRT ahead with prior votes, including an Aug. 14, 2015 decision to create an LRT implementation office to work on the updated project that calls for a line from McMaster University to the Queenston traffic circle. The city also signed a binding real estate protocol this fall. 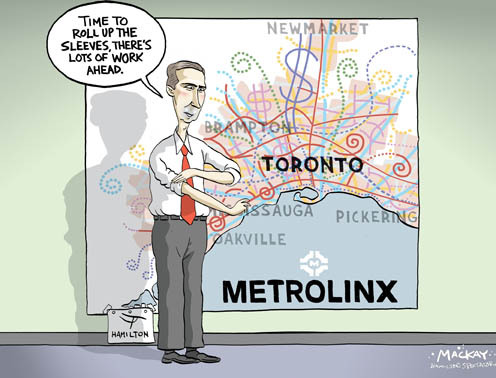 City LRT point person Paul Johnson also noted Metrolinx has “spent or committed” between $60 million and $70 million on LRT planning so far, including 20 city staff and six Metrolinx officials working out of a local office as well as several consultants studying traffic, real estate and technical route issues. Quebec MP Steven Blaney is running for leadership of the Conservative Party, and his first major policy position is a ban on the niqab and a promise to invoke the notwithstanding clause if courts strike down his new measures. The former minister in the cabinet of Stephen Harper said he will introduce legislation that would forbid the Islamic face-covering while voting and taking the oath of citizenship. He also said that the prohibition would extend to people working in the federal public service. The measures are necessary, Blaney said, to “ensure the sustainability of our integration model” and to protect women’s rights. The proposal revives a controversial debate from the last campaign, when Harper himself suggested the niqab should be banned from the public service.